Key difference: The difference between the two pencils is that the ‘HB’ pencil has a medium lead, whereas the 2H pencil has a soft lead. 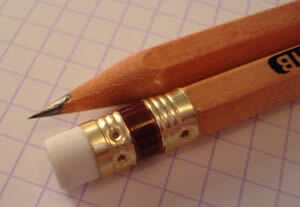 A Pencil is a popular tool used for writing as well as drawing purposes. Pencils were developed in the year 1970. They are made of wood with a graphite core inside. Pencils are actually a combination of clay and finely grounded graphite, mixed with water and pressed together at high temperatures. This process was developed by Nicolas-Jacques Conté, a Frenchman, in 1795, and it is still the widely used method by the pencil manufactures. By this process, manufactures started to label pencils according to their hardness; they were distinguished into four grades, and according to the numerical grading system, 1 was for being hardest and 4 was for being the softest. Also, the terms such as HB, B, F and H are used. Here, the H stands for ‘hard’ which is designated for hard leads, and B stands for ‘black’ which is designated for softer leads. Also, any number in front of HB, or B, or H simply indicates the shade of the lead. 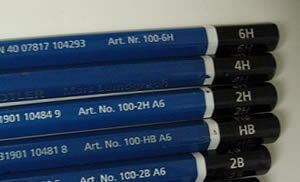 HB pencil is one of the most popular in the lead hardness categories. They are standard and known for their general writing purposes. The term ‘HB’ is universal and is usually printed on all pencils. It means that the pencil is hard and black, and depicts the hardness and the nature of the lead used in the pencil. HB pencils have a limited amount of clay in them, which gives a medium line density while writing. The pencil lead is mediocre in shade which leaves a visible mark on the paper. Also, the pencil has good tensile strength and gives a smooth feel while writing. Being light in shade, these pencils are easy to erase, which makes it a favorite among the children who use it to improve their ‘penmanship’ in school. On the other hand, 2H pencils are used for more technical purposes. The 2H pencils have a hard lead, which means they are lighter in shade. Also, these pencils are made up of large amounts of clay that creates a very light line density while writing, and doesn’t even leave a mark on the paper. Although, these pencils have an exceptional tensile strength, they too give a smooth feel while using. Because of their hard lead and light shade, 2H pencils are ideal for drafting and engineering applications. These grading systems can be a little confusing, but they sure do help and make it easy to pick and choose the right pencil when required. The term “HB” stands for hard and black. The term “2H” stands for hardness of the lead of the pencil. It is made of large amounts of graphite with little clay. It is made up of large amounts of clay. It is lighter in shade. It is very light in shade. It is used for general writing purposes, and by kids in school to improve their writing skills. They are used for technical applications such as engineering and drafting, etc.